from The New York Times, 11/21/2007. As soon as I read this recipe, I knew what not to do. I’ve tried numerous times to inject humidity into the oven by placing pans of water and spritzing loaves once or twice during baking. And not once has the crust of a loaf baked in that manner matched the hard shell I get when I bake the dough in my Le Creuset Dutch oven as the original NYT slow-rise bread recipe calls for. When I gave this recipe a try, I didn’t even bother to try the water-pan method. I’m glad I didn’t. As I said, I revised the recipe right off the bat. Instead of all-purpose flour, I used King Arthur’s Bread Flour. The yeast, Rapid-Rise, also derives from the Slow-Rise recipe. I let the sticky dough sit in my big plastic tub, loosely covered, for 3 hours. Then I put it in the fridge. The next day, with flour-dusted hands, I tore off one big wad of dough, shaped it into a ball by tucking pinched edges under it, and placed it on a flour-dusted tea towel. I folded the towel lightly over the ball and let it sit for 40 mins. About half an hour before baking, I put the covered Dutch oven (see Slow-Rise post) in the stove before setting the temperature to 475. When it came time to bake, working quickly, I removed the pot, took off the lid, and flipped the ball of dough smack center in the middle of the pot. I quickly covered the pot again and stuck it the oven. Then I reduced the heat to 450. The bread baked for 20 minutes, at which point I removed the cover and baked it for 20 minutes more. When it was done, I put it on a rack to cool. While the first boule baked, I got another one going. And then I didn’t make any more bread for a week. A week later, the dough had soured beautifully. 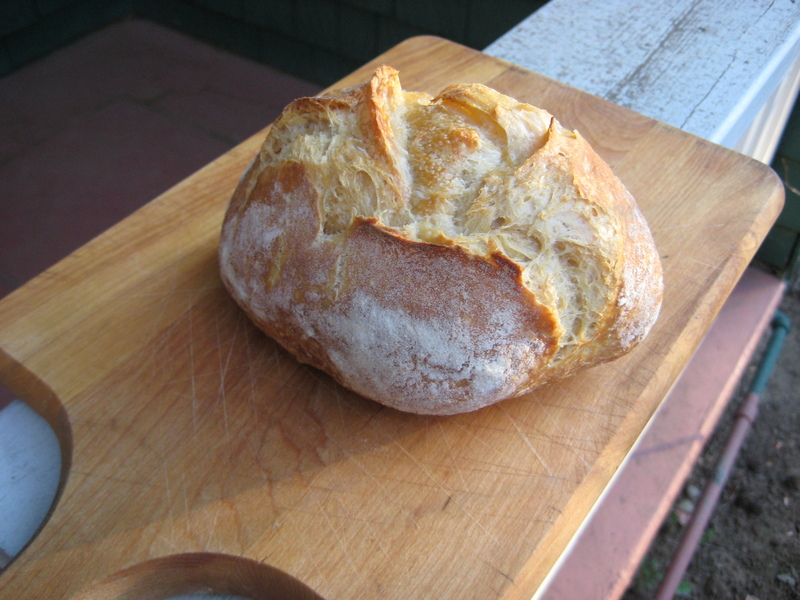 The photos of the small boule above are the last bread I made from my first batch. Great crust. Wonderful crumb. Good bite to the flavor. 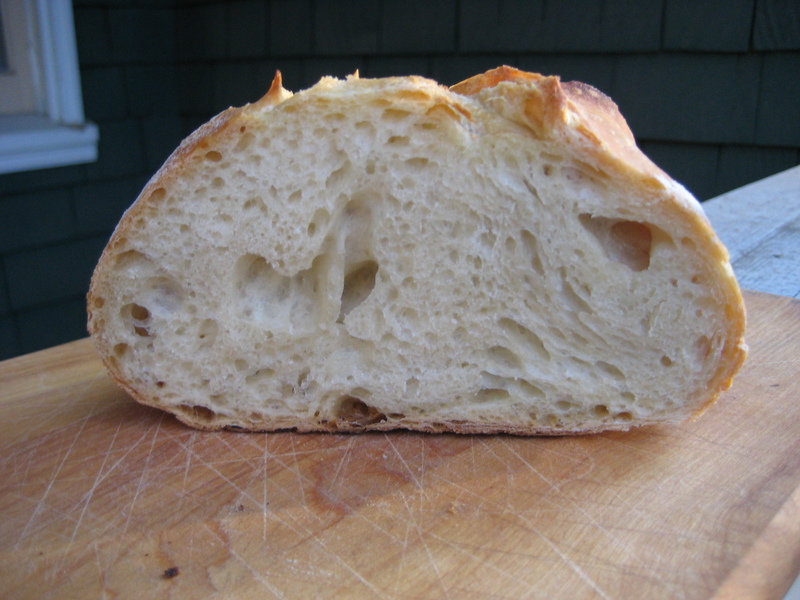 When I make this again, I’m going to add malted barley powder, as I do to the Slow-Rise bread. This bread, however, couldn’t be more convenient. It sits in the fridge, ready-made practically, until you’re ready to bake. I also want to experiment with adding whole-wheat flour to the dough.